Growing up to 8cm long these fish are territorial and hide under stones or vegetation on the bottom of fast, stony rivers such as the Gilwiskaw Brook but are also found in the River Mease. They emerge at dusk to feed on bottom living insects, crustaceans and other invertebrates. The fish spawn between February and June, laying their eggs underneath stones, woody material, tree roots or in pits, the eggs being guarded by the male. The adults possess no swim bladder, meaning that they naturally sink in the water. This has been linked to their relative lack of movement with studies showing that some will only move up to 10 metres over a period of 8-months with a home range based upon a single stone. 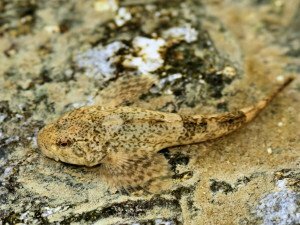 Although this species is widely distributed in the UK, at a European scale this species is comparatively rare which makes the UK population of European significance.